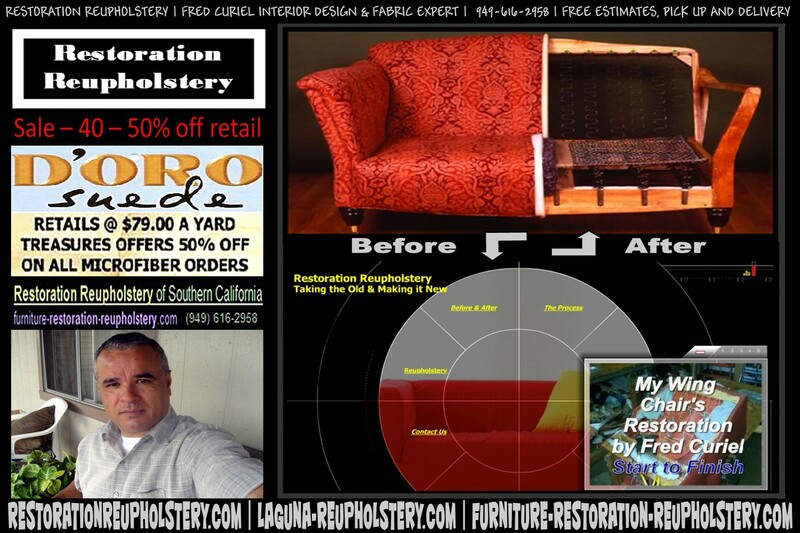 Restoration Reupholstery buys factory direct, which guarantees you the chance to see all options and styles with free no nonsense quotes | (Email us a picture and the story fabric wish, rebuild, repair, restuff, etc) at amazing prices. Buy new and then call to see our mobile show room bring out the fabric and foam options to help make the decisions within your budget. Fred and Ivankas Restoration projects often end up better than when you bought it Change the fabric to the color, foam, lengthen or customize into the piece you wanted it to be! Restoration offers complete servies and materials required for unique masterpieces, one of a kinds, as well as all Antique, Modern, Contemporary Furniture and Marine Restorations. Custom Redesign Services are also available and are discussed with your Vision and Creation Consultant. Take a look and see what we have done. Fred Curiel's 33 plus years of experience in all aspects of the furniture business give him the ability to offer impeccable workmanship, hand crafted perfection, outstanding customer service with prices that match the best deals available in Southern California. Tags: CUSTOM UPHOLSTERY FURNITURE,Teak Furniture Restoration, furniture upholstery recovering,dining room chairs for sale | Restoration Re Upholstery also offers free pick up and delivery from your door and back which gives you the freedom to just let Fred have it and bring it back better than new. Offering: PILLOW RESTUFFING, SOFA REUPHOLSTERY, OC RESTORE FURNITURE, REUPHOLSTER LEATHER, CUSTOM UPHOLSTERY, REUPHOLSTERY CHAIR, REUPHOLSTER DINING CHAIR and related services.